As the name of this coin suggests, the 100 Euro Wartburg gold coin belongs to the series of Euro gold coins that commemorate the German cities that were added on the NESCO World Heritage Sites list. This gold coin was minted in 2011 and until now it is the last coin minted that belongs to this category. As we all know, the start for these beautifully engraved gold coins was given by the 100 Euro gold coin commemorating the city of Quedlinburg in 2003. The 100 Euro Wartburg gold coin was issued in a fairly scarce mintage, each of the five German mints Berlin (A), Munich (D), Stuttgart (F), Karlsruhe (G), and Hamburg (J) manufactured 60,000 gold coins. Therefore, we have a total of 300,000 German gold coins minted in 2011. Like all its predecessor gold coins, the 100 Euro Wartburg gold coin has a 28 mm diameter, it weighs 15.55 grams, and most importantly it has a purity of 99.90%. It means that it is manufactured from 1/2 troy ounces of gold of 24 carats. The 100 Euro Wartburg gold coin presents the Wartburg Castle mounted on the hills in such a way that it overlooks the city. The inscriptions found are the UNESCO WELTERBE WARTBURG in a semicircle above the castle and below the castle are found the following words: Gegr. 1067, Ludwig der Springer, Hermann I. 1207 Sänger, Krieg. Hl. Elisabeth, Luther Wartburg, and Fest 1817. The 12 European stars are designed in a semicircle in the superior part of the reverse of the 100 Euro Wartburg gold coin and at the bottom of the coin, exactly under the German eagle can be observed the following inscriptions: BUNDESREPUBLIK DEUTSCHLAND which is the minting authority, the issuing year 2001, and the face value of 100 Euro. The 100 Euro Wartburg gold coin illustrated on our website was minted in Hamburg, as you can notice after the letter J, which is the last inscription present on the reverse of this gold coin. 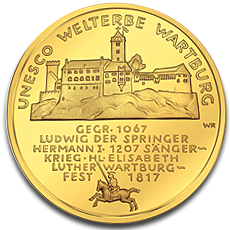 If we were to consider the limited mintage of only 300,000 gold coins to which we were to add the fact that the 100 Euro Wartburg gold coin is the last coin minted, until now, belonging to the series of commemorative UNESCO gold coins, we definitely could state that this gold coin is of immense interest for collectors. Investors regard the 100 Euro Wartburg gold coin as a coin that will become more profitable as time passes, but numismatist will observe the true beauty engraved on this coin, collectors will appreciate the sentimental value that this gold coin transmits. Investors that acquire a 100 Euro Wartburg gold coin can hold on to it until there are very few gold coins of this kind left on the market. At that moment collectors will bid increasing sums in order to purchase a coin found in the best condition and so rare. Or they can wait for the gold spot price to increase since this gold coin, like all the others, is priced in accordance with the price for gold plus a premium. Investors and collectors can acquire the 100 Euro Wartburg gold coin from our website.